I finished the second book in the Murder most unladylike mystery series called ‘Arsenic for tea’. This book sees Hazel Wong go to her best friends house, Daisy Wells (chairwoman of the detective society). Unfortunately a murder is committed against a rather dodgey fellow who appears to quite like Daisy’s mum! Hazel finds it tricky to solve the case with Daisy as half of the suspects are in her family! I really enjoyed this book, even more so than the first in the series. I found the story line to be less complicated and more original. I fell for many of the ‘red herrings’ thinking myself to be a detective expert – how wrong I was! Although this book is in a series, it introduces the characters well, therefore, you don’t need to read the first one. I also read a book by Siobhan Dowd. I have mentioned her before on this blog when explaining how she set up a charity before she died to help disadvantaged children access books. Although her book was not necessarily suitable for children in primary school, it is always advantageous to know of good authors for the future. Whenever I look around a bookshop, authors names jump out to me, as well as medal award winners etc. For your teenage selves in the future – if you see Siobhan Dowd, pick it up! 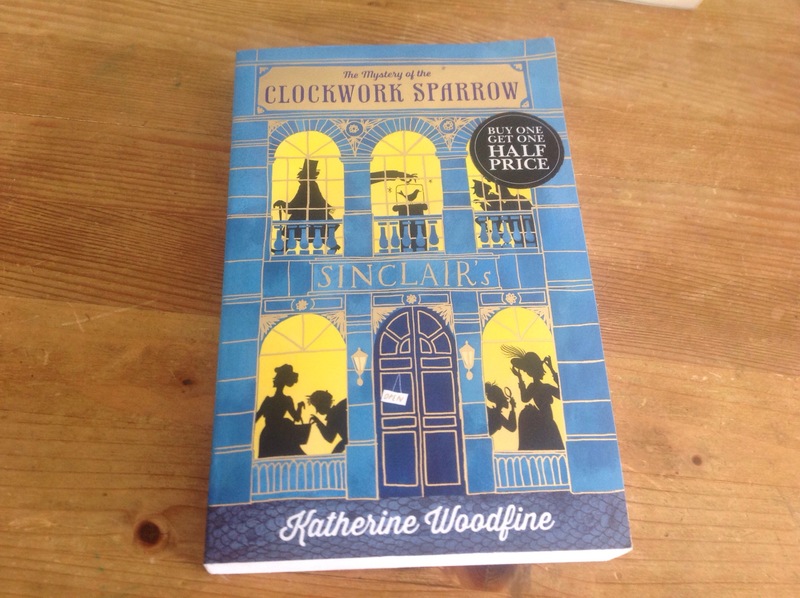 The third book I read in my week away was ‘The mystery of the clockwork sparrow’ by Katherine Woodfire. This book called to me when I was looking around Waterstones with a book voucher in my bag very kindly given to me by a pupil in my class at the end of term. I ended up buying double the amount of books I intended to… Anyway, since read child detective type stories, I thought I would give this one a go! It is set in the early 1900s in London where the main character, Sophie Taylor, is starting work at a brand new department store (sort of like Harrods or Liberty). I love the setting and all of the old fashioned language and her side kick type friends are interesting characters too – Lilian and Billy. Some of the story line was a bit farfetched and not very believable, but hey it’s fiction! If it was all believable then it would probably be a bit boring. All in all I managed to escape into this books and really relax whilst on holiday. Hurrah! My favourite read of the holiday was ‘Arsenic for tea’. Next Post Oh. My. Goodness. I don’t like books that describe everything either, it can sometimes get a bit over powering. P.S. Does anyone actually like Jaquline Willson, as I think I am the only one who does. I don’t think you’re alone Maisie. I used to love her when I was younger. Haven’t read any other stuff for years. I think she’s ok. She isn’t my favourite author of all times but if I didn’t have something to read I would pick up a JK book. I’ve recently read one by her called cookie too, it was very good.